The New Feature Blip.tv touts as a Feature? 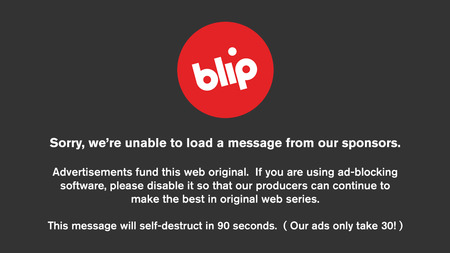 So if you’re seeing this, don’t worry this is Blip.tv new feature. Heading over to the support page I found this post, with comments disabled. Note these are support pages for producers, so tell me how this is called a feature announcement without their producers being able to chime in. Bad move Blip; if you need money this bad just bring back the Pro account. It’s kind of joke, this is going to only hurt producers and the loyal consumer. The loyal view will always donate funds or even their own time to help promote their favorite web show. As long as sites like YouTube and NewGrounds aren’t doing this kind of BS. Good luck trying to stuff this kind of BS down our throats, it's just not going work in the long run. As a part time producer, consumer and longtime follower of Blip.tv this really irked me. This year Blip.tv has been doing some not so independent webcast friendly changes. Everything from removing their PRO account to forcing ads on all videos and removing people not fit to their standards and don’t get me started with giving The YouTube shows a leg up on Blip.tv network. Blip started out as an alternative to YouTube with emphasis on episodic webcast. But at some point they started removing features and have yet to really introduce anything new. Honestly they still have 2gig max video upload... But if you’re part of the YouTube partnership you seem to get a lot more space. They should at least add the ability to chapter mark videos, something new not less. They added the Facebook commenting system and removed Disqus, which is a hundred times better. When searching for names of a show, be warned you will only find those they deem searchable. Video pages/channels where updated with nice page layouts, again you better be one of their favorites to see this change. It’s insane that a company that started out with the idea of all users/producers getting equal treatment; only to lose to YouTube, since they only like to cater to them. Options what are they, well I don’t know really. If avoiding YouTube was the goal, then it might be harder to do then we previously believed. New grounds, Open film and others are out there, but I’m not too sure how they will turn out in the end.